A problem often encountered by coaches training young hurlers, is the bad habit of switching the hurley from one hand to the other during play. The "Corrector" is a simple device designed to discourage such practice. 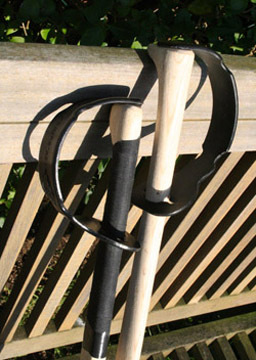 It can be tacked on to the hurley to suit either right-handed or left-handed players (as shown). It has a user-friendly feel that will not resrict the handling of the hurley. When it is no longer required, it can be easily removed and passed on to another, making it not only attractive but economical.